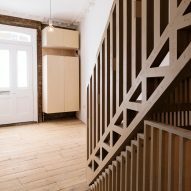 Nearly 2,000 pieces of plywood slot together like a puzzle in this staircase, which features in a London home that has been overhauled by local studio Tsuruta Architects. The architects were tasked with reconfiguring the layout of a seven-bedroom 20th-century house to create an open-plan living, kitchen and dining room; two bathrooms; and four bedrooms on the upper three floors, as well as a flat in the basement. 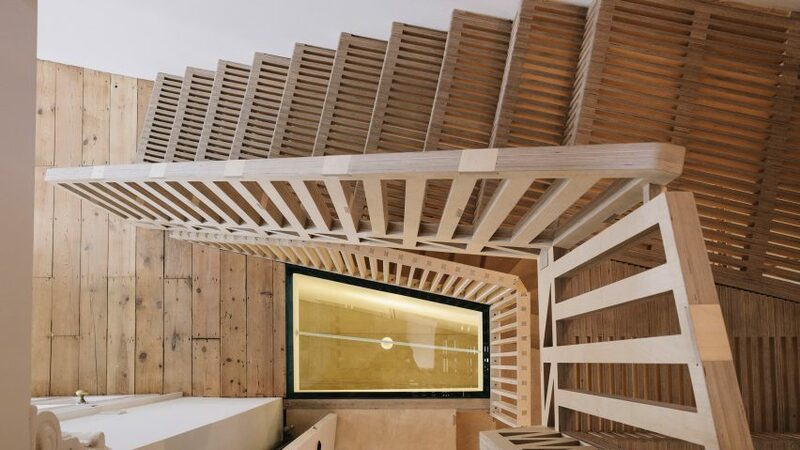 To accommodate the new arrangement, Tsuruta Architects replaced the large staircase with a more compact version that leads up the house's four storeys. Gaps in the treads, risers and balustrade filter daylight down through the residence and are intended to maintain the "essence" of the original design. "The challenge was to replace this once favoured staircase, while enhancing this previous spacious quality," studio founder Taro Tsuruta told Dezeen. "The perforated timber treads and risers, and balustrade of the new staircase let through light and air, but in a more compact overall configuration," he continued. "An essence of the airiness from the original staircase can still be experienced in addition to providing more evenly divided bedrooms on the first floor." On the ground floor, the stairs also dogleg around an irregular skylight over the basement. The architects employed digital fabrication to make the staircase out of 1,872 pieces of plywood. The material – which is the subject of a new exhibition at London's V&A museum – has recently been used in a number of innovative ways by designers and architects. Other examples include a pavilion constructed by an army of robots, a series of ice-skating shelters and a pavilion made from 8,000 lightning-bolt-shaped pieces of plywood. Tsuruta Architects created a 3D model in SketchUp first to decipher the shape and number of pieces necessary to make the staircase. These were then modelled in 2D and laid out to fit the standard size of a sheet of plywood – 1,220 by 2,440 millimetres – before being sent to the CNC machine. The cut pieces arrived on site numbered and were accompanied by a 14-page instruction manual, which detailed the construction "for any carpenter to understand". It took two and half weeks to build. L-shaped sections were glued and nailed together to form the treads and risers, and then rods were threaded through holes left in the steps to join with the balustrades. These are made of larger sections of cut plywood. 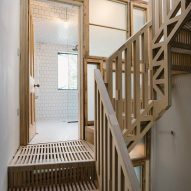 Another 300 pieces of plywood were also cut and combined with an old window frame to form a translucent screen that separates the stair landing from the two bathrooms and a utility room. "Light continues to flow into the stairwell via this screen wall and new external windows," said Tsuruta. "By recomposing these old objects, we aim to keep the past tense in a new form, giving it new life rather than just conserving old." Some of the plywood pieces are engraved with text from the emails the architects exchanged with the client. 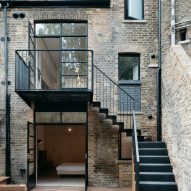 Other features of the renovation include the addition of a black steel balcony at the rear of the house with steps that lead down to the back garden. 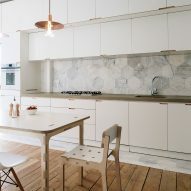 It is accessed from the kitchen and dining room, which features white wooden cabinets running along one wall and pale hexagonal tiles that form the splashback and a strip of flooring. A small extension was also added to the top of the house. 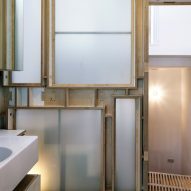 This level hosts the master bedroom and a walk-in wooden wardrobe, which gives the project its name, Marie's Wardrobe. 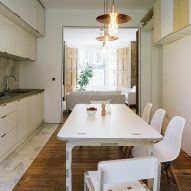 It is among a series of simple wooden furnishings in the house, such as folding window shutters and a bed frame supported by a pleated wooden structure. 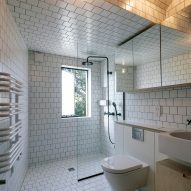 The rest of the house is finished simply, with bare plaster walls, and white tiles in the bathroom that offset exposed brickwork. 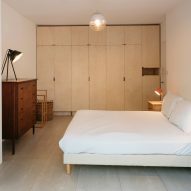 Marie's Wardrobe was the winner of a RIBA London Award 2017. The prize forms part of the RIBA National Awards for architecture, recognising the best buildings created in the UK in last 12 months. This is not the first time that Tsuruta Architects has been recognised for a London house extension. 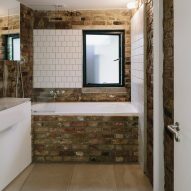 Last year, the studio's House of Trace – a two-storey addition to a Victorian property in south London – was the winner of the Don't Move, Improve 2016! competition to find London's best house extension.